Protect the Last City, Iron Temple, and citizens from harm. One of the first groups of Risen to band together to maintain peace and equality. "In the years after the Collapse, the world had no Guardians. It had only Iron Lords." The Iron Lords are a group of Guardians who are honored during the Iron Banner monthly Crucible event. "Some know the legend. But no one truly knows how the Iron Lords died their final deaths. That was something you had to be there for. To witness. To remember. To know even heroes can die. And survival is not always a victory." In the first years after the Collapse, a time before the rise of the Vanguard and the Last City, some of the earliest Guardians to be revived chose not to protect the world, but subjugate it. Taking over various parts of the planet, some Guardians became Warlords and injustice reigned, with the rest of the populace living under the tyranny of the various factions. Eventually, Guardians with integrity chose to stand up to their tyrannical brethren and form the Iron Lords. More and more noble Guardians joined the cause until an army hundreds strong was formed and the oppressive warlords were deposed, along with the Fallen who ravaged the Earth. One former Warlord, Lord Felwinter, was swayed by the Iron Lord's message and decided to join their cause. 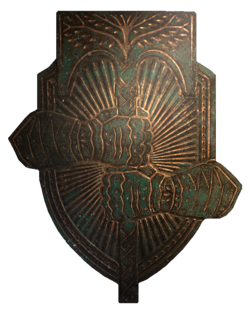 Following the Warlord conflict, the Iron Lords dedicated themselves to defending survivors of the Collapse and restoring civilization. The Iron Lords protected the newly constructed walls of the City in the infamous Battle of Six Fronts against six Fallen approaches, and not a single front faltered. During this conflict, the Iron Lords were known for their invincible patrols and their contributions to the great Wall-Building, cementing their legend. Seeking a way to rebuild what was lost during the Collapse, they eventually found SIVA. Hoping it would be able to build ships and colonies, the Iron Lords pushed through the Cosmodrome despite Rasputin's desperate attempts to sway them and suffered the loss of hundreds of Lords to a combination of aerial strikes, a Frame army, and SIVA constructs. Ultimately, the venture would result in the loss of all save for Saladin Forge and Efrideet, who had disappeared to live in the wilds beyond the city. The eight Iron Lords who made it, save for Lord Saladin, sacrificed themselves to contain the biomechanical plague by sealing themselves within its replication chamber before it had time to escape. The sacrifices of the most well-known Lords are honored at the Iron Temple atop Felwinter Peak, and celebrated in the Iron Banner tournament. The names of their signature weapons are lent to various Iron Banner equipment, such as the Felwinter's Lie Shotgun and the Jolder's Hammer Machine Gun. The second generation of the Lords, the Iron Wolves, and their weapons are likewise honored by the Iron Banner. Following the SIVA Crisis, a new generation of Guardians has begun taking up the mantle of the Iron Lords. The Iron Lords' classes were mostly speculated from the items of the Iron Banner, although new information from the Rise of Iron DLC confirmed them all. Radegast is the name of the slavic god of hospitality, but is better known as one of the five wizards from J.R.R. Tolkien's Lord of the Rings. Perun is the slavic god of thunder and lightning. Timur, also known as Tamerlane, was a 14th century Turkic-Mongol conqueror. There are several artifacts in Destiny that are named after the Iron Wolves that are available as random drops or as rewards from the monthly Iron Banner tournament but unlike those for the Iron Lords, they give little to no information on their classes. Saladin's namesake was the first Sultan of Egypt and founder of the Ayyubid dynasty.